With Lucy as our inspiration, the WE LOVE LUCY FUND will be dedicated to helping save the lives of other pets in need of urgent medical attention. Lucy, a victim of life-threatening burns due to a backyard fire that killed her two puppies, received exhaustive medical care over the course of several months for her catastrophic injuries, thanks to OPIN's intervention and the support of generous donors. (Read her story below, or check out the installments summarizing her progress on the NEWS page.) Ultimately OPIN was able to place her in a wonderful new home, where currently she is thriving happily. If you can support this effort, please make your check payable to OPIN, Inc., and in the memo line, indicate We Love Lucy Fund (or WLLF, or just Lucy), and mail to: OPIN, Inc. / P.O. Box 488 / Riverside, CT 06878-0488. Or you may donate online; but please be sure to indicate WLLF or Lucy in the message section. Thank you for your support of those who most need our help! PLEASE SEE OUR NEWS PAGE FOR UPDATES! Lucy is a four-year-old bull terrier who recently had two small puppies. Lucy was forced to sleep outdoors in a makeshift doghouse in her owner’s yard, covered with a tarp and space heater. The tarp caught fire and her puppies were sadly killed. It is thought that Lucy was trying to protect her puppies and that is why she did not run away. 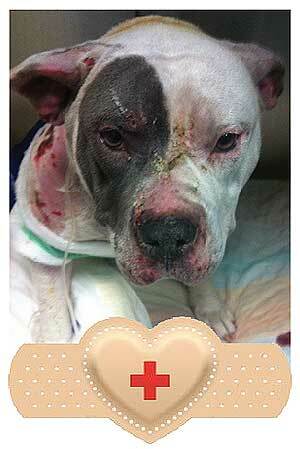 The kind-hearted veterinarians of VCA Norwalk were able to save Lucy. She is very badly burned, but is expected to make a full recovery. We are establishing a fund for Lucy's treatment. Please help, if you can. Every dollar counts. Lucy will need a home upon her release. She is a sweet, loving dog. If you are interested in adopting Lucy, please complete an application on our website and questions may be directed to outreach@opinpets.org or call, 203-326-0216.. It is winter. Dogs should not be outside any longer than we would. Frostbite and hypothermia are deadly conditions. Do not adopt, buy or give a home to a pet unless you have permission from your landlord or it is in your lease. Please call Animal Control or the Police if you see animals outdoors for long periods of time or any other alarming condition. We are their voice. Please tell friends, neighbors, and contacts to spay or neuter their pets. OPIN offers low cost and no cost "SNIPS" in Stamford- thousands of programs exist in the United States. Please help us prevent this horrible event from happening somewhere else.